Having gone through two years of repairs, from JSC Dalzavod emerged the Pacific Fleet’s flagship, Guards GM cruiser Varyag, so named after its legendary predecessor. Incidentally, not too many people today know that in the beginning of the 90s of the last century, the metallic plate on the side of the most powerful ship of the Pacific Fleet carried a very different engraving - Chervona Ukraina (Red Ukraine). And the place of duty of the GM cruiser was not Primorye, rather it served as part of Kamchatka Flotilla of Mixed Forces. As the Soviet Nation fell apart, for understandable reasons the name of the ship changed as well. And soon its stationing location followed. Everyday life of the cruiser's personnel for the last two years has been dedicated to one goal - restoring the equipment. Even the daily routine set by the ship’s Regulations was changed to speed up the repair work. "Admiral Hour", the traditional after-dinner rest time in the Navy, was cancelled for everyone. Seamen helped out factory workers, in essence for a time turning into general laborers. Many others carried out whatever work they could do themselves to improve their living quarters and battle stations. Sailor’s hands were also needed to set order to the area allotted to be used by the crew as cafeteria on the territory of the ship repair factory while equipment was being replaced in the ship’s food unit. 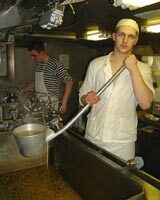 Pots and stoves were cleaned until they shone, floors were washed, walls - bleached. 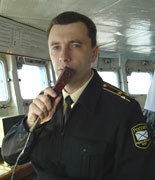 Head Instructor of the Supply Corps, Sub-Officer (Guards) Oleg Ignatyev and the Head Cook-Instructor, Senior Sub-Officer Vitaliy Razomazov, managed to organize wholesome nourishment for the crew on shore for a time period of over half a year long. According to the ship's Captain, the entire crew, without exception, was helping out factory engineers and workers. Among the ones who especially distinguished themselves in this complex process, the first to mention are – Officer in Charge of the Engineering Department, Captain of the 2nd Rank (Guards) Anatoliy Vasilchuk, Main Propulsion Division Officer in Charge, Captain of the 3rd Rank (Guards) Aleksey Noga, Supply Engines Unit Officer in Charge, Lieutenant-Commander (Guards) Vasiliy Eremeev, Common Ship Machinery Unit Officer in Charge, Captain of the 3rd Rank (Guards) Evgeniy Tkachenko, and Communications Officer in Charge, Lieutenant-Commander (Guards) Denis Sopatenko. Among those who took care of the crew’s welfare daily - Chief Boatswain, Sub-Officer (Guards) Mikhail Semenov and many other officers, sub-officers, mates, and sailors. During one of the outings from the factory into the Peter the Great Bay waters, Varyag, remembering the good old times, got up to maximum cruiser speed of 32.5 knots. Man-of-war’s men, having spent too long by the moorage wall and missing the real combat work in the sea, even in those few days got charged with positive energy. Since before the sea trials, an entire draft of sailors and mates had to learn the naval science using only the simulators or during specialty trainings on the ship. According to AAC Missile Division Digital Control Unit Chief Corporal (Guards) Nikolay Ivanov, drafted by the Fleet from the Sverdlovsk Region in the fall of 2006, he felt quite differently as soon as the ship finally left the factory for the open sea. A desire came to get a fill of the romance of the sea, and an idea to sign the contract after finishing up the involuntary service. In the improved galley the food tastes better too! As a side note, there are some sailors and mates among the crew who served on the cruiser before its repair and had a chance to participate in the visits to other countries. Contract sailors are like the backbone, around which forms a combat-capable team. Among the most commendable military men of the contract service are Squad Leaders, Mates of the 2nd Article (Guards) Dmitriy Vengura and Valmir Shangareev, Senior Seamen (Guards) Anton Semichkin and Maksim Stepanov, Mate of the 1st Article (Guards) Boris Rudenko, and Seamen (Guards) Boris Dmitryaychev and Mikhail Petrov. The lieutenant reinforcements are also impressive - in the last year alone, 12 graduates from various Navy institutions of higher education in the nation joined the crew. It goes without saying that one of the most significant events for the Varyag crew this year was February 9, with two memorable dates celebrated at the same time - the 104th Anniversary of the heroic battle and the downfall of the cruiser Varyag in the Russo-Japanese War and the day the Guards flag was raised. Part of the crew visited the Morskoye (Marine) Cemetery, paid respects to the Russian sailors by the Memorial to the men of the cruiser and the gunboat Koreets (Korean), while the rest were receiving the naval artists who presented a big festive program. In January ("Old Style") of 1904, in an attempt to break through from the Korean port of Chemulpo into Port Arthur, two Russian ships – a cruiser Varyag and a gunboat Koreets - engaged in an uneven battle with the Japanese squadron. In one hour of battle they damaged three cruisers, sank a torpedo boat, but sustained serious damages themselves and could not continue the sea fight. At the order of the Varyag officer in charge, Captain of the 1st Rank Vsevolod Rudnev, Koreets was detonated and the cruiser - sank. ”The return of the Guards GM cruiser Varyag to the line of duty was an exceptionally important and a happy event for all of us, man-of-war’s men of the Pacific Fleet. No wonder! This immediately raises the Fleet’s prowess. There is a good reason that this particular class of the Russian battle ships was nicknamed "aircraft carrier killer" in the NATO classification system. Our Varyag is armed with a powerful multi-purpose ballistic attack system that allows it to hit large surface and ground targets at considerable distances. In addition, its arsenal includes anti-submarine mortar systems, torpedo launchers, and several gun mounts of various calibers and uses. I am convinced that we will be hearing more than once of the flagship’s participation in large-scale technical manoeuvres and long marches. Today, the name most often mentioned in the national newspapers is that of the Guards GM cruiser Moskva (Moscow) of the Black Sea Fleet, which made a name for itself the other day in the Atlantic. 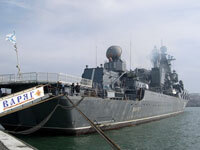 I am sure that soon the Pacific Fleet’s Varyag will become the center of attention.